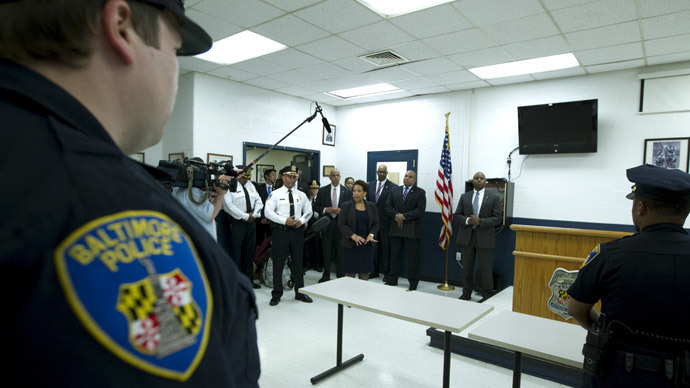 US Attorney General Loretta Lynch visited Baltimore and promised support to both police and the local community after last week’s riot resulted in emergency measures, a curfew and heavy National Guard presence. Lynch also promised the Department of Justice would provide assistance in addressing “systematic issues” with the Baltimore PD, after Gray’s death in police custody resulted in criminal charges against six officers and raised serious concerns about police misconduct. “We're here to hold your hands and provide support," she said. The DOJ has already announced it would conduct a civil rights inquiry into Gray’s death and send additional officials to Baltimore to help ease tensions between the community and police. The country’s top law enforcement official and the first African-American woman to hold the post, Lynch was sworn in on the same day the protest in Baltimore boiled over into violence, just hours after Gray’s funeral. Gray’s family did not wish to speak to reporters. Later in the day, Lynch met with local religious leaders and legislators. Among those present were Reverend Donte Hickman, whose church lost a senior center under construction during the riot on April 27, and Congressman Elijah Cummings (D-MD), who spent much of last week on the streets keeping the protests peaceful. At the meeting with members of the Baltimore Police Department, Lynch called them “the hardest-working police officers in America,” reported The Hill. Vanita Gupta, head of the Justice Department's Civil Rights Division, and Ronald Davis, director of Justice's Community Oriented Policing Services (COPS) office, accompanied Lynch on the trip; her first venture out of Washington since taking office. On April 12, six Baltimore PD officers arrested Gray, 25, because he ran away from them after “making eye contact.” Later that day he was admitted to the hospital with his spine severed at the neck. After a week in a coma, Gray passed away. On the day of his funeral, clashes between riot-geared police and high-school students in West Baltimore escalated into a full-blown riot. Hundreds have been arrested, while the mayor of Baltimore established a curfew that was eventually lifted on May 3. Maryland’s governor declared a state of emergency and called in the National Guard. Protests continued until the state attorney general pressed charges against the six officers.